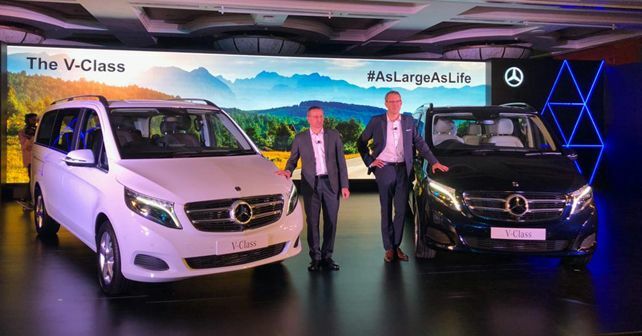 Mercedes-Benz has kicked off 2019 by making a return to the luxury MPV segment in India with the launch of the V-Class people carrier. Produced at Merc's Vitoria plant in Spain and imported to India as a CBU, the V-Class has been priced at ₹ 68.4 lakh (ex-showroom). However, at this stage, the Stuttgart-based firm is yet to confirm plans about the local assembly of the V-Class. The V-Class marks Mercedes-Benz's second attempt at entering the luxury MPV market in India – the first attempt was the launch the R-Class in 2011. The R-Class, due to low demand, failed to fetch good sales and, consequently, was discontinued soon. While the V-Class is offered in three variants in the international markets, in India, it goes on sale with a two-variant lineup – the V 220d 'Exclusive' and the V 220d 'Expression'. While the 'Exclusive' variant is a 6-seater Long Wheelbase version (LW), the 'Expression' variant has been launched as a 7-seater Extra Long Wheelbase (ELW) version. The ELW version measures 5,370mm in length (230mm more than the LW version) and has a 3,430mm wheelbase. One of the key factors that make the 6-seater version more expensive than its Extra Long Wheelbase counterpart is its unique middle row arrangement. The two armchair-style individual seats, which make up the middle row, have been bolted on swivel mounts that allow them to be turned and face the third row. However, both variants feature a sliding door for rear seat access, much like the Kia Carnival. The two variants on offer here also differ in terms of their feature and equipment offerings. While the Expression trim gets luxury basics like dual-zone climate control, a standard infotainment system, comfort suspension and 16-inch alloy wheels, the Exclusive trim goes one step further to offer a longer equipment list, consisting of high-performance LED headlamps with Intelligent Light System, AGILITY CONTROL suspension setup with selective damping, electric sliding doors, ambient lighting, COMAND infotainment system and larger, 17-inch alloy wheels. Available as an optional extra, V-Class customers can add to the luxury quotient with a 640 W 15-speaker Burmester surround sound system. In terms of safety features, the V-Class gets six airbags, Active Parking Assist with a 360-degree reversing camera and a PRE-SAFE Attention Assist. Providing firepower to the V-Class is a BS-VI compliant 2,143cc diesel motor, which pumps out 161bhp and 380Nm of torque. The power is sent to the rear wheels via a 7G-Tronic automatic gearbox. While the motor belongs to Mercedes' older OM651 family of engines (as compared to the new-spec OM654 engine series), it can still propel the V-Class from 0 to 100km/h in a matter of 10.9 seconds, and thanks to a hardware upgrade, the motor is now BS-VI compliant.